Amelie Goddard was born in Christchurch, Hampshire, close to the New Forest in southern England but lived most of her life within the boundaries of the national park. Both Amelia and her elder sister Eliza (b. 1840) became artists and travelled to France to further their studies when Amelia was still in her late teens. The sisters would show their work at exhibitions together and the height of their careers came in 1904, when a show entitled The Knot of Grass, composed entirely of Amelia and her sister’s work, was held at the Dore Gallery in New Bond Street, London. Much of Amelia’s subject matter was drawn from the lives of those who lived within the New Forest, principally gypsy families who had roamed and lived in harmony with the forest for generations. Amelia and Eliza’s grandfather, John, had been a doctor who had always been prepared to help the poorer members of society. It was Amelia’s experience as a young girl, seeing him tending to the poorest souls of the Forest that formed her close affiliation with these people who existed on the very edge of society. 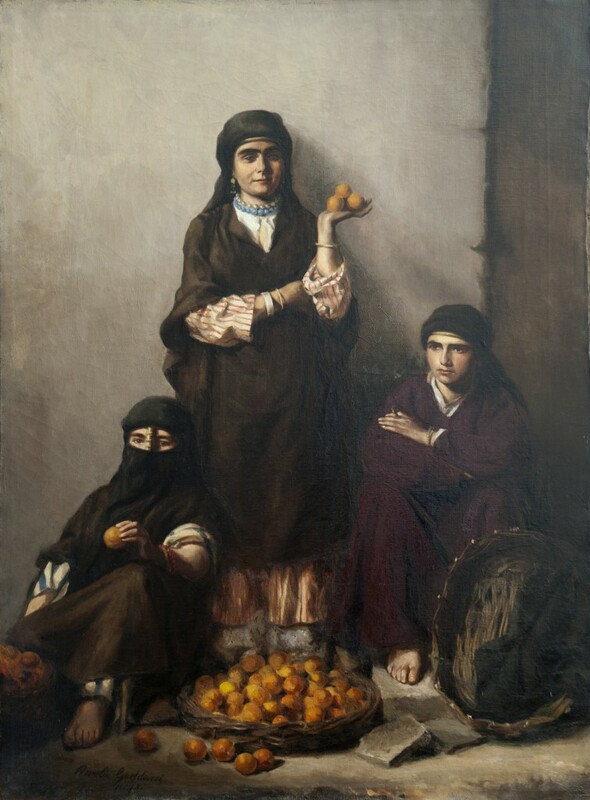 When I came back from a spell of long study in Paris, in 1875, Dr. Robert Druitt (Phyician) an old friend & schoolfellow of my Father’s, saw my studio, & gave me a handsome order to do a picture of Egyptian Orange Sellers. He having just returned from that country. He instructed me as to the costumes but left me to choose my models. I was on the verge of going to town to hunt up professional ones, but as Christmas Fair was in full swing, & more of a function in those days than now, I happened to see a van with a splendid Type of woman, & some children, moving off down the street rather quickly, and I ran after putting on my hat, a long distance to overtake them. With some great persuasion I brought her to the studio, then and there and my was, with my Mother came to look at Mrs Selby White. And we 3 agreed she was perfect for what I wanted. The work is presented in its original gilded frame.